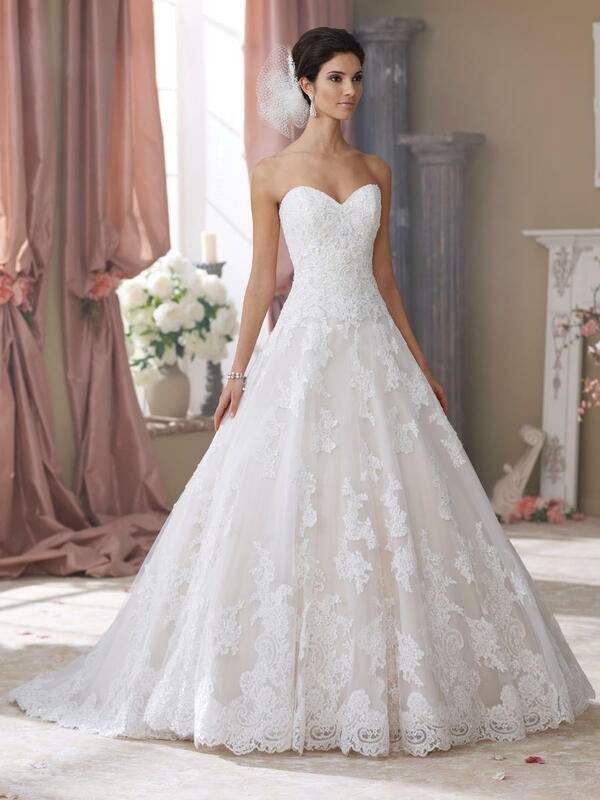 Strapless corded lace appliqu�, tulle and organza over taffeta ball gown wedding dress with sweetheart neckline, hand-beaded corded lace appliqu�d bodice with dropped waistline features a slightly curved back bodice with cascading covered buttons, tulle and organza full skirt with cascading matching beaded lace appliqu�s spill into a scalloped hemline with chapel length train, detachable spaghetti and halter straps included. As shown in Ivory/Blush: The Berger Collection for Mon Cheri headpiece style 9608 and Russian veil style 9519x sold separately. Embellish by Martin Thornburg ring style Sophia, earring style Meredith and bracelet style Gina sold separately. As shown in Ivory: The Berger Collection for Mon Cheri tiara style 9611 in Silver sold separately. Also available in Gold. Embellish by Martin Thornburg ring style Sophia, earring style Claire, necklace style Claire Pendant and bracelet style Jacqueline Bangle sold separately.